26 June: This page won't be updated any more but you will be able to find all of our latest news, both before and during the race, on our new news page/blog which is at atlanticdouble.wordpress.com (or press the News button above). You can sign up to receive e-mail notifications of updates there, and should you feel the urge, even comment on our comments. 20 June: It's been a most eventful few days for Tiger Team. 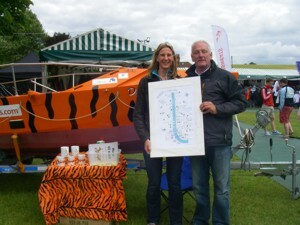 Didi (the boat) is now totally tigered and was on display at Women's Henley and not surprisingly caught many an eye! Whilst Helena was working in race control there, friends sold raffle tickets in aid of the Huntington's Disease Association, and then took over the running of race control so Helena could take over on the final day, also helped by Olympic medallist Sarah Winkless who presented the prize - a limited edition print over the course by artist Annabel Eyres kindly donated by Rock the Boat - to the winner. Altogether we raised over £250 - a small but useful start. 5 June: Find out how you can help us - it will only cost you the price of a bar of chocolate (and possibly a stamp) - through our Message on a Chocolate Bar initiative! In other news, our boat will be on display (on land) at Henley Women's Regatta on 17-19 June, and on the water at Henley Royal Regatta from 29 June to 3 July inclusive, mostly moored outside Upper Thames. 24 May: We are now taking orders for Tiger-Team T-Shirts! Full details here. Closing date is 10 June. 21 May: Didi is back on our drive, and partially tiger-ified! The stripes are vinyl stickers, made from offcuts kindly donated by the nice man at the Signs Shop in Walton. She still needs a few more towards the bows on strokeside, and her bowside is still completely naked, but the Signs Shop man suggested Helena comes back next Saturday by which time he will have generated some more offcuts! The generosity of people if you just ask is often wonderful. 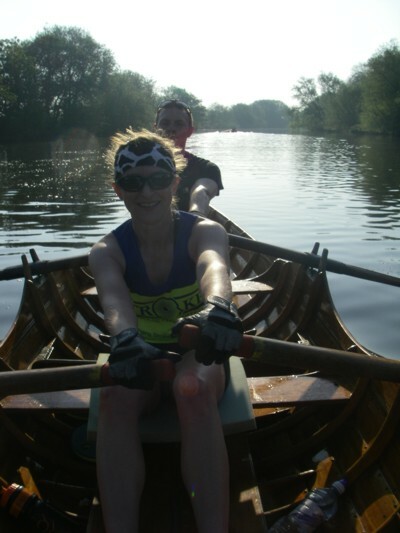 Helena enjoyed some excellence longer-distance rowing training over teh 4-day Easter weekend when she skiffed down the navigable, non-tidal Thames from Lechlade to Teddington as part of a 6-boat trip with Thames Valley Skiff Club. It was an absolutely top trip, and also provided a good opportunity to test out our Torq energy powder and gloves. 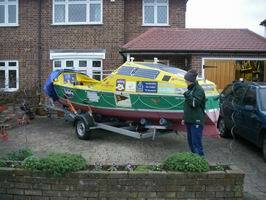 She'll be doing some slightly shorter but more "up and down" rowing on 14/15 May when she takes part in the Explore Rowing Coastal Challenge involving a row along the South Coast one day and out to the Needles rocks at the end of the Isle of Wight the next. 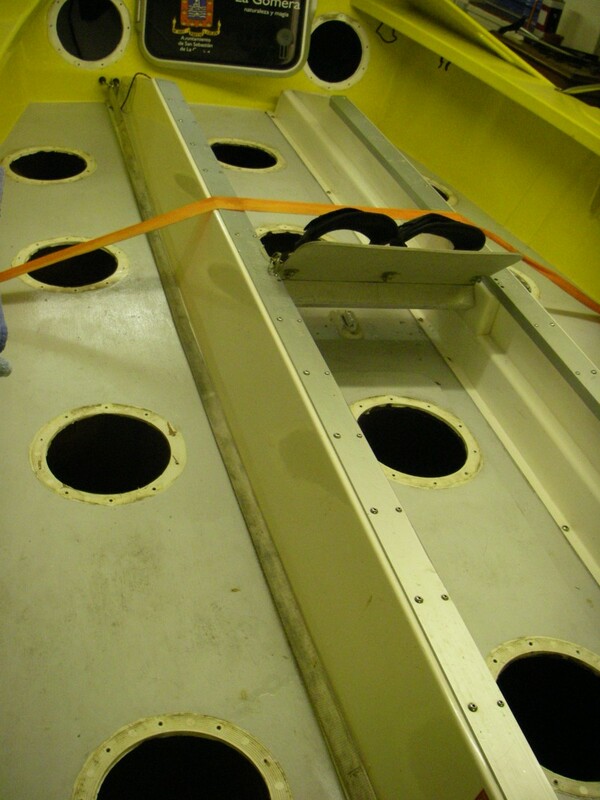 30 March: With the painting completed, including 2 coats on the deck - the final one including "anti-slip granules", last Sunday saw both of us working on fitting the new deck hatches. Whilst we're confident that the outcome of our labours is both secure and watertight, we're also sure that the professionals wouldn't have finished up with quite so much Sikaflex all over themselves, or have had to take their socks off in order to have enough rags that didn't leave dark-coloured lint in those anti-slip granules to wipe off the excess Skaflex. Still, the ability to improvise is important in ocean rowing, so we'll pretend that we were merely exercising our skills in this area. Less positive news is that Helena has now spent over 3 weeks with a trapped nerve in one shoulder, which has rather hampered her training. Still, she's been busy coxing, and whilst this doesn't directly further our Atlantic campaign, we have gained 40 free Heater Meals, and hopefully a prominent mooring for Henley as a result. 20 March: And another 3 weeks - whoosh! Mind you, Helena has been quite busy coxing at Reading Head and the Women's Head, which partially explains lack of huge progres. However, the orange painting is now complete and Didi is progressing from her past look as a green and yellow floating daffodil to a swimming tiger. Still haven't got a firm plan for how we're going to do the stripes yet, but probably as stickers. Today she had her first coat of deck paint and is looking pretty smart. 27 February: Another month has sped by! We've been testing dehydrated food options - Lamb Pilaf with Rice, and Beef Shepherd's Pie (would that be Cottage Pie, then?) 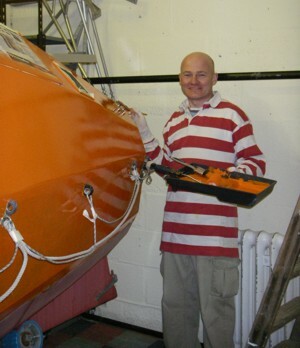 are good, Thai Curry less so - researching dfood suppliers in order to get enough variety in, and most importantly, starting to apply orange paint to the boat! She's going to need 2 coats, and as the paint is harder than household emulsion to work with, after 2 days' painting, one aided by Helena's college tutorial partner Philip, she still isn't yet oange all over, but we're geting there. Meanwhile we're delighted to have Helena's employer, MindTools.com on board as a sponsor! 4 February: Exactly 10 months to go till the scheduled race start! And whilst I'm slowly progressing getting the boat ready and sorting out food another competitor in "our" race has just set out... to row the Atlantic! And what was he doing this time last year? You guessed it - rowing the Atlantic! You have to agree that's properly mad and we're really not that extreme in comparison. Find out more at http://www.amigocrossing.com. But back to today and all things tigery, and we're delighted to have added Torq Fitness to our list of sponsors in kind (as mentioned obliquely in the update below about the London Boat Show). Torq have given us an extremely good deal on their energy powders which you add to water to make recover drinks - for whilst you're rowing, and after each session. The stuff for whilst rowing genuinely tastes like you've squeezed a fresh orange, lemon or pink grapefruit into water, whilst the post-exercise stuff is like a chocolate orange, chocolate mint or strawberries and cream thick shake. We've also got a lot of fruit and cereal bars which taste like real fruit (they contain no added sugar), and some guava gel with caffeine - some of which are going to be reserved for the very end of the row, where crew often have to row almost continuously for 48 hours to battle currents and things to make the finish line. And to "cap" it all, they've given us beanies, gel-padded cycling gloves (yes, I know we wouldn't wear these for river rowing but square-blading it across an ocean is different), and a very large number of water bottles. Top people! If you do any kind of endurance sport, do check out Torq's products - they're excellent. 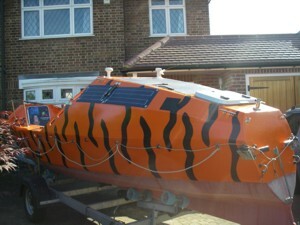 And the really good bit is that their logo is black and orange which fits perfectly with our tigery colours! 22 January: Great excitement at Tiger Team Towers yesterday as a consignment of yacht paint, varnish, cleaners and anti-foul coating was delivered, courtesy of Hempel Paints. Hempel, formerly known as Blakes Paints in the UK, also supplied all of the coatings that Didi is currently wearing, and they're clearly excellent as there's hardly a scratch on her despite her many travels. Rog, her previous owner, has particularly praised the quality of the anti-foul as he had almost no trouble with barnacles on her bottom, whereas other crews were having to hop into the water to scrape barnacles off theirs (and let's remember that sharks ARE known in the area), or suffer excess drag. We're hugely grateful to Hempel for their generosity. 16 January: It's been a grand weekend for progress of various sorts. Helena spent Saturday at the London Boat Show talking to key suppliers including: Ocean Safety who will be supplying our life raft, life jackets and flares, their related company which will be doing our safety courses (10 solid days in September in Southampton); Mailasail who will be providing the satellite phone and software to allow contact with all of the outside world during the race (you will be able to send us 160-charater texts for free - which won't cost us anything to receive either); and Hempel Paints who have very kindly offered to supply us with all of our paint needs for free! There is no end to the amount of "stuff" you need for an ocean row, but fenders have at least been ticked off the list (and at a good price from a nice man at somewhat inappropriately named Compass Marine, the "UK's Number 1 Fender Specialist"). And she also had her photo taken with Ben Fogle, who said "Good luck" and assured her he wouldn't be doing the race again (having been in the first pair to cross the line, with James Cracknell, in the 2005 race). 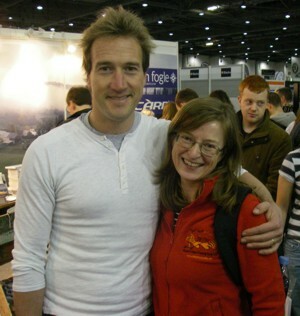 Ben Fogle was at the Outdoors Show signing books, selling socks (well, his people were, though that makes it no less strange), and not minding having his photo taken with random aspiring ocean rowers. And on Sunday we did our first day's work on the boat, removing all of her existing stickers/decals and also all 14 of her deck hatches which are slightly cracked and so need to be replaced. You don't take any chances on oceans. 8 January: Hooray! With considerable effort from 3 strong men (thanks Pete and Steve) Didi is at last indoors. And once we get some keys to the premises, we'll be able to start work on her: cleaning her, removing her old decals, replacing the existing deck hatches, many of which have cracked (easier said than done as they're WELL stuck down with waterproof sealant as well as screws), replacing one of the solar panels which is slightly damaged, replacing her steering lines, doing something (not sure what yet) about the uprights for her guard rails, 2 of which get in the way of the blades at the catch, and then the easy bit of sanding and painting her. Thank goodness there are still 11 months till the off (about 10 till she needs to be delivered to the company that will ship her out to the start). But before all that can start, Helena will be visiting the London Boat Show next weekend with a substantial wish list of chandlery and safety equipment! 2 January: Still not managed to get Didi inside as the day we had arranged to move her was the day of the big snow before Christmas. However, we we delighted to receive our first charity donation to St Mungo's – from Keith and Isobel Martin, parents of Atlantic and Pacific rower Chris Martin, whom we both coached a little bit at the very beginning of his rowing career. 5 December: A kind supporter has offered us a perfect indoor space to keep DiDi in for her refurbishment, subject to it being possible to wiggle her in through the doors, and we had hoped we might be able to take her there this weekend, but the snow rather put these plans on hold. 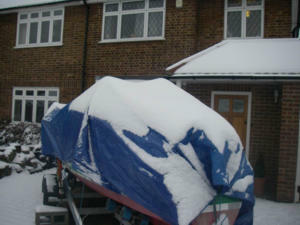 Fingers crossed for next weekend, subject to everyone's availability, and NO MORE SNOW!. 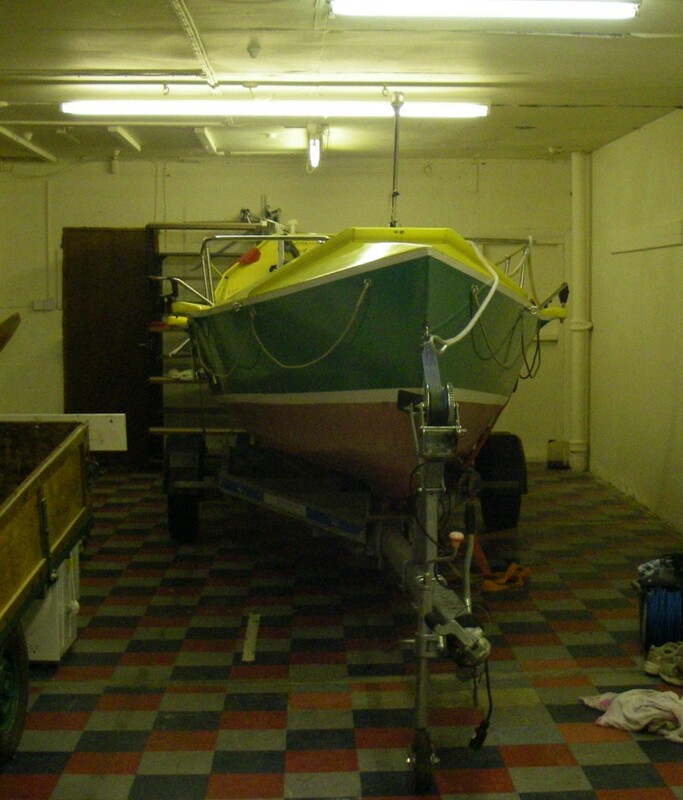 28 November: When we had the boat surveyed prior to buying it, the surveyor blithely said "Once she's yours, take the watermaker out and send it off to be services". Seemed reasonable. But when you come down to it, and open the hatch with this critical piece of equipment in, you're left wondering "WHICH BIT? Eventually, aided by some phone calls to "Spectra Jim", the wonderfully helpful watermaker expert, I worked out which 4 bits DID need to be removed, and which 3 should be left in. Mind you, even that wasn't simple, as it took a lot of work with a hairdryer to get the hoses flexible enough to persuade them to come off the various pumps. And then I couldn't find a box big enough to pack it all in, so in the end, I drove it all down to Southampton today. Seemed safer like that. Richard enjoyed a nice 16km scull today, Helena equally enjoyed 10kmin a single skiff (these outings took similar amounts of time). Both relied on pogies. These should not need to be part of our "capsule" Atlantic wardrobe. And some important news just released: the finish has now been confirmed as Port St Charles, Barbados, rather than English Harbour, Antigua, which is where recent races have gone to. The distance is about the same, although we've heard that the currents around the top of Barbados can be tricky. Port St Charles is on the north west side of the island. Helena's quite pleased about this change as she had previously been to English Harbour, Antigua to welcome in her friends Chris and Clint in 2006, an it will be more exciting for both to be rowing to an unfamiliar destination. 21 November: A year today we have to be in La Gomera for 2 weeks of final preparations and scrutineering. So it's timely that we brought DiDi home today. We hope that we'll be able to move her to an indoor location soon so that we can start work repainting her and making minor modifications and improvements, but for the moment, we've managed to squeeze her onto our drive. The neighbours were fascinated! 19 November: My, doesn't time fly? Today's VERY exciting news is that our logo has now been finalised! We love it. In fact, we think it's grrrrrreat! Mugs and Polo shirts available soon, T-shirts some time next year. 19 October: We finally decide which charities we're going to support - St Mungo's and the Huntington's Disease Association. For more about these worthy causes, see our Charities page. 9 October: We take ownership of Dream It Do It (aka DiDi)! 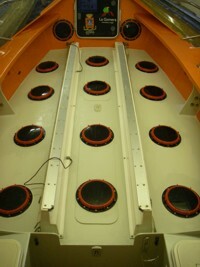 22 September 2010: Boat survey and web development (that's this site that you're reading! ).